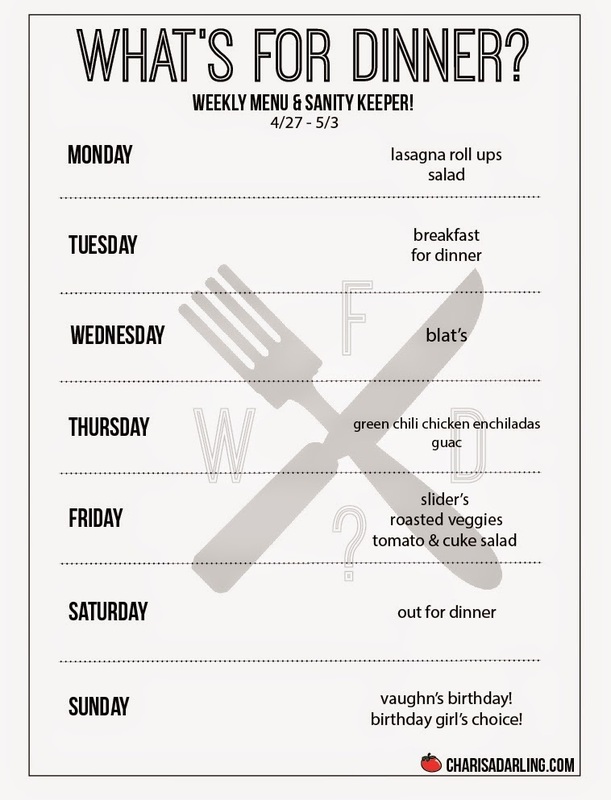 This week I'm going to utilize some meals that I've had in the freezer. (Mainly from dishes that I've made too much of and have stuck in the freezer, rather than saving for leftovers that end up getting trashed because no one eats them.) Between you and me, I've frozen them in dishes that I need, so let the unthawing begin! Tuesday will be a quick breakfast for dinner - diner's choice of what's around. Wednesday will again be something quick, BLAT's. Thursday will be green chicken chili enchiladas and guacamole. Friday and Saturday are really up in the air due to not knowing the game time's of Vance's baseball tourney. We didn't end up doing last weeks sliders, so if we're around I'll plan for that on Friday. Sunday is Vaughn's birthday and she gets to pick. There's different dinner scenarios in place that depend on if Vance's team plays on Sunday but they all include chocolate brownies with chocolate icing and rainbow sprinkles. That's my girl! Vaughn and rainbow sprinkles. Of course! Happy birthday to her! How old will the ruby-cheeked soccer player be? Also, I now have a bag of those sweet potato waffle fries you recommended in my freezer. I'm hoping to enjoy them later today. Thanks! I can't believe she'll be turning 7! Time sure does fly! I haven't tried the sweet potato waffle fries, but hope you like them! Thanks Cathy! Heading there now to check it out!